A federal judge has allowed his lawsuit against the University of Illinois to proceed, and the chancellor who rescinded his appointment last year has resigned amid an ethics investigation. Certain administrative officials at the University of Illinois used personal email to conduct university business and failed to turn over those documents during Freedom of Information Act requests, a violation of university policy, a UI probe has found. The news comes one day after Chancellor Phyllis Wise announced her resignation as chancellor. The personal emails released by the university included many from Wise, but a university spokesman declined to say whether the ethics investigation led to her departure. Almost exactly a year ago, that paper, the Champaign News-Gazette, broke the story of Salaita’s tweets, which brought issues of academic freedom and freedom of speech to the fore, not to mention the question of whether or not speech regarding sharp and angry criticism of Israel in particular warranted a suspension of those rights and freedoms. Despite the initial show of support, however, the University soon changed its tune. Letters and emails obtained via Illinois’ Freedom of Information Act revealed that students, alumni, and donors wrote to the University’s Chancellor, Phyllis Wise (“Wise”), to voice their concerns over Dr. Salaita joining the University. One writer in particular claimed to be a “multiple 6 figure donor” who would be ceasing support of the University because of Dr. Salaita and his tweets. The university defended its actions on two grounds, both of which the federal court has just thrown out. 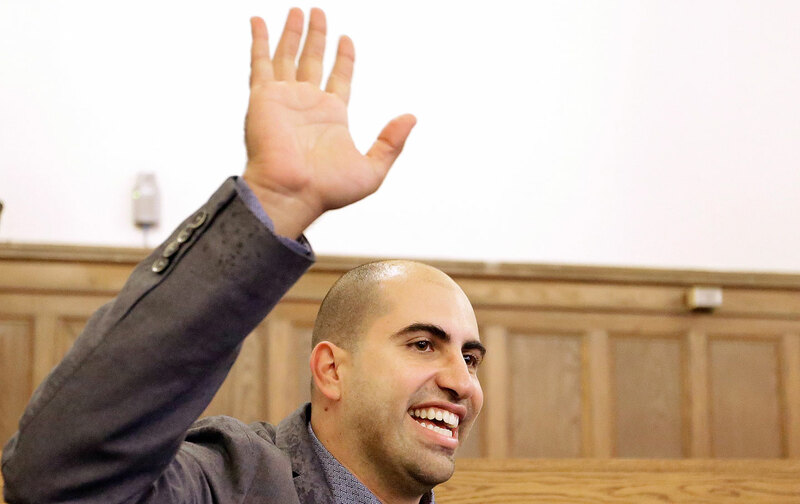 First, it argued that Salaita was never officially an employee of the university despite the fact that he had been offered a tenured position in a written document, was assigned courses to teach, had been given orientation materials, and had been invited out to look for housing, all customary practices in academic recruiting and hiring. Customary, too, is that one extends to one’s current employer one’s resignation so they can fill one’s position and have one’s teaching covered. This meant that by refusing to honor its part of the agreement, the University of Illinois was rendering Salaita unemployed (and his wife as well, as she had quit her job to relocate to Urbana-Champaign) and his family without a home. The final formalities of university hiring are usually undertaken after new faculty have arrived on campus, for it is then that boards of trustees normally meet to give their stamp of approval to a process that is handled entirely by faculty governance and administrative review. Chancellor Wise and those members of the board of trustees (chaired by Christopher Kennedy, son of the late Robert F. Kennedy) who were now motivated against Salaita used that interval and that opportunity to abort the appointment. Now the judge has knocked down both of the two pillars of the university’s argument against Salaita’s suit. The University paid for Dr. Salaita’s moving expenses, provided him an office and University email address, assigned him two courses to teach in the fall, and stated to a newspaper that he would in fact join the faculty, despite his unsavory tweets. The University spokesperson went so far as referencing Dr. Salaita as one of “our employees.” The University also did not hold a Board vote until after the start of the semester. If the Board vote was truly a condition to contract formation, then the University would have the Board vote on appointments before the start of a semester and before spending money on a new professor or treating the professor as a full-fledged employee. Finally, the University actually held the Board vote despite its claim that it had no agreement whatsoever. If the University truly felt no obligation to Dr. Salaita, the University could have simply not put the appointment to a vote at all. Instead, the University still went ahead with the vote, which is at least some evidence that it felt obligated to hold a vote according to the terms of the offer letter. Simply put, the University cannot argue with a straight face that it engaged in all these actions in the absence of any obligation or agreement. The University…argues that Dr. Salaita was not fired because of his constitutionally protected speech, and that even if he was, the University’s interest in providing a safe and disruption-free learning environment outweighs Dr. Salaita’s free speech interest under the balancing test in Pickering v. Bd. of Educ., 391 U.S. 563, 574 (1968). …Dr. Salaita’s tweets implicate every “central concern” of the First Amendment. Burson v. Freeman, 504 U.S. 191, 196 (1992) (stating that there are “three central concerns in our First Amendment jurisprudence: regulation of political speech, regulation of speech in a public forum, and regulation based on the content of the speech.”). The Court therefore declines to engage in a full-fledged Pickering balancing analysis at this early stage in the litigation. Although Pickering balancing is not appropriate at this stage in this case, it appears that the evidence is conflicting as to the level of disruption Dr. Salaita’s appointment would cause. Thus, viewing this evidence in Dr. Salaita’s favor, it seems unlikely that the University would win its Pickering challenge at the motion to dismiss stage. Dr. Salaita’s Complaint alleges facts showing that he was fired or not hired because of the University’s disagreement with his personal speech in a public forum on a matter of public concern. This is enough to survive a motion to dismiss. "The Supreme Court has warned of the dangers inherent in punishing public speech…because of the particular words or tone of the speech.…"
Thus the court found the university’s argument that this was not about free speech to be bogus, and, most significant, it found that Salaita’s speech was especially protected because it had to do with an issue of overriding public concern. What is crucial to note here is that, rather than putting the issue of Israel-Palestine aside because of its reputed “divisiveness” and its “disruption” of university life, the court ruled that it is precisely because of its centrality to our public discourse that Salaita’s tweets, and speech—and in fact all of our discussions around Israel-Palestine, no matter what view we take—need to flow freely. So now that we have a firm ruling on that, why turn to the issue of the ethics charge against Wise and others? Precisely because we now know the exact nature of the damage their actions had against our freedom of speech and Salaita’s academic freedom. [The] ruling comes on the heels of an Illinois state court’s decision in a Freedom of Information Act lawsuit on June 12 ordering university officials to turn over emails related to Professor Salaita’s firing that they had refused to divulge, as well as a vote by the American Association of University Professors (AAUP) to censure the university on June 13. What we now know is that Wise and others, upon realizing what a hot-button issue this had become, switched their discussions over to their private e-mail accounts to avoid discovery. However, under the FOIA ruling, the demand for e-mails would include all e-mails regarding the case, regardless of what kind of account they were posted through. This is of course to prevent the kinds of evasions Wise and her colleagues sought to use to protect themselves. Anyone who wishes to read some of the newly discovered e-mails will see what Wise and others were trying to hide. The news release notes that these private e-mails take on other controversial subjects as well, besides the Salaita case. As we see the case against the university gathering more and more strength, it is absolutely crucial that we do not lose sight of the damage that has been done by the university and those who worked behind the scenes to influence the administration to one person’s career, his livelihood, his family. We should not ignore how power and wealth can operate to shut down unpopular opinion. And finally, we need to remember that issues of great public concern, such as Israel-Palestine, should not only be discussed, but also need to be discussed in the most free and open manner possible, and not censored. Steven Salaita has paid the price for bringing these issues into the foreground. The least we can do is make use of the rights that he has shown we should all cherish.